Our catalog has been a staple of the instrument technician’s shop for decades and is now available for download by our customers. 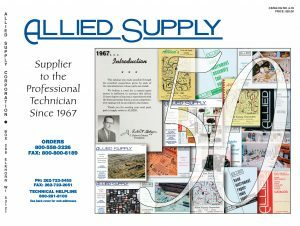 Every tool manufactured by Allied Supply after June 1, 1987 carries a lifetime guarantee to the purchaser. If the tool breaks or unduly wears during normal usage, we will either repair or replace it at no charge. Yesterday our very own Craig Anderson was honored with lifetime membership in NAPBIRT (National Association of Professional Band Instrument Repair Technicians); this is the highest honor a member can receive. We are very proud of Craig and his contributions to our industry. Congratulations from all of us at Allied Supply, Craig! Read "NAPBIRT honors Allied’s Craig Anderson"